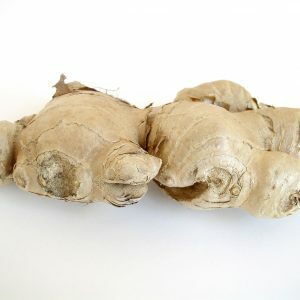 Ginger (Zingiber officinale) is a flowering plant that is popularly used as a spice or medicinal herb. This plant grows about a metre tall, with narrow green leaves and yellow flowers that originated in the tropical rainforest of Southern Asia. This herb no longer grows wild but is commonly found in India. Indian ginger also has the largest amount of genetic variation. 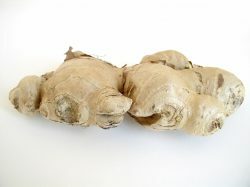 Ginger was exported to Europe in the first century AD and was used extensively by the Romans. The rhizome (root cluster) is the main part of the plant that is harvested and used. In small quantities, ginger has very few negative side effects. It should not be used in conjunction with the blood thinner drug warfarin (or even aspirin), or the cardiovascular drug nifedipine. Using ginger during PREGNANCY can be harmful if used for longer than 4 days. This herb should not be taken until after a consultation with your doctor as it can cause harm to the foetus, and increase the mother’s risk of bleeding. Children under 4 years old should not take it. Ginger can also cause heartburn, and people who suffer from IBS, ulcers, gallstones, or blocked intestines may react badly. It is advisable to not take more than 4 grams of ginger per day.